One of the first books that cycling enthusiast parents look forward to reading to (and with) their children is the classic Curious George Rides a Bike. 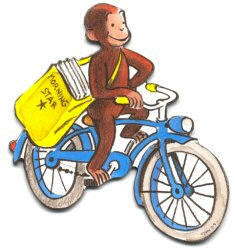 Did you know that there is a much more serious connection between bicycling and Curious George? The authors of the Curious George series were Margaret and Hans A. Rey. While working on the first books of the series, they were German Jews living in Paris during the Nazi occupation of France. Using spare parts, Hans put together two bicycles, which the couple used to flee Paris and the Nazi persecution. Using the bicycles, plus a combination of ships and trains, they eventually made their way out of France, to Brazil, and finally to New York City, where they eventually made arrangements to get the books published. The story of the Reys' earlier lives, and their narrow escape, was made into a 2005 picture book by Louise Borden called The Journey That Saved Curious George. Thanks to UrbanVelo for the story and links.